We now have a date for Shards launch – the 12th of this month. It comes with a set, and appropriate, end date – the 4th of March “GM’s Day”. 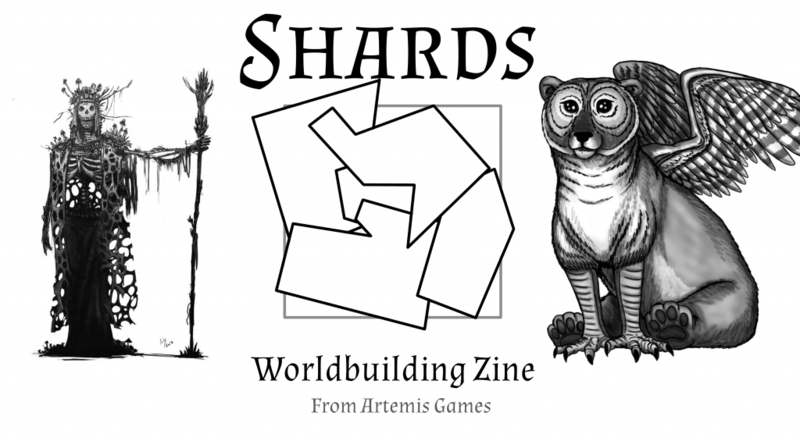 We’ll be doing 6 issues over the next 6 months, each with three shards of setting – at least one being sci-fi and one being fantasy – a fourth article on worldbuilding, and a letters section where our resident agony aunt The Letter Lich can help you solve your worldbuilding and game-running problems. Each issue is a minimum of 36 pages long, but there’s also going to be a high-roller backer level that allows the backer to fund 4 additional pages for every copy of the zine, for all six issues; because sometimes it feels good to give! We’re currently finalising the writing and art for issue #1, and will be launching with those in the bag and at least half of May and June’s articles already written – insuring against any future schedule slips.